The prickly pear cactus is native to Texas, California, and other southwestern states, as well as in Mexico and the Mediterranean. Here in south Texas, they grow everywhere; in fields and alongside the roads. And many people plant them in their yards because the flowers are so pretty. 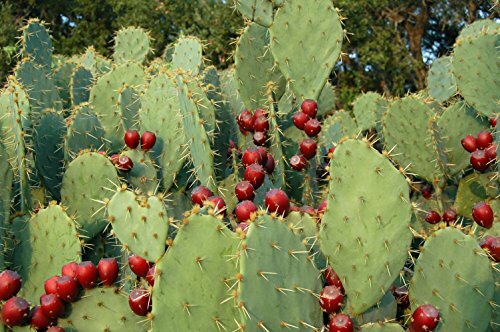 I don't know about all cacti, but you can definitely eat the prickly pear; the cactus pads and the fruit. If you harvest your own, be careful of thorns! I haven't read anywhere that people eat the flowers, although many other flowers are edible. Even though the prickly pear cactus is mostly found in desert areas in the American southwest, I've have seen it growing in the states of Illinois, Missouri, and Tennessee, too. There are Many Species of Prickly Pear Cactus in the U.S. The Prickly Pear cactus has two types of spines. It has large spines about an inch long and then small thin prickles called glochids. You can easily see the large spines and avoid them, but the glochids are small and easily overlooked. If you get these tiny prickles in your skin, they hurt! This prickly pear cactus has the most glochids of any cactus I've ever seen. There are a few species of prickly pear cactus that are spineless or almost spineless, but all cactus will have glochids, including the fruit. To harvest the pads or fruit, wear leather gloves or use tongs. If you're going to eat a fruit in the wild, you can singe the glochids off with a lighter or match. At home, you can use a hard bristle brush to scrape them off, making sure they don't fly off onto the counter where you might touch the later. No matter how careful you are, you still might get a few tiny glochid prickles in your skin. They are hard to remove with tweezers. Instead, you can try using duct tape or a liquid glue like Elmer's. Place the tape on your skin and yank it off, or pour some glue on your hand and pull it off after it dries. In both cases, the spines should come out. If that doesn't work, you might try a drawing salve. If that doesn't work, just wait and the spines will eventually be absorbed into your skin. 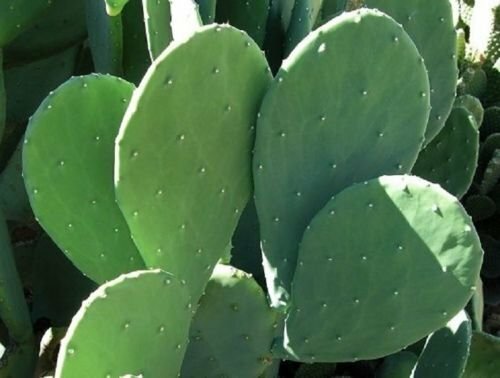 Prickly pear cactus pads can be eaten raw, boiled, pickled, or stir fried. I've sliced them and cooked them with scrambled eggs. You can harvest your own pads (watching out for spines), or buy fresh or canned from a store (if available in your area). Bring water to a boil in a large pan. Lower the heat and add the chopped nopales. Simmer for 20 minutes. Drain the water, rinse the nopales, and chill in the refrigerator until cool. When cool, place the nopales into a salad bowl with the chopped tomatoes, peppers, beans, onion and cilantro. Toss with a dressing and the shredded cheese. 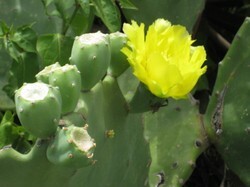 The prickly pear cactus fruit is also called cactus fig, Indian fig, or tuna in Spanish. The prickly pears are edible fruit, but they have many small hard seeds inside. You can peel them and eat them raw, but many people use the juice to make jelly, juice, candy, or vinaigrettes. 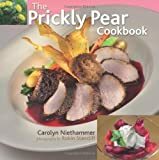 You can find prickly pears in most Mexican markets, farmers markets, and sometimes in natural food supermarkets stores. They will already have the tiny thorns removed. You might find the fruit either green or red. If they're red, they've ripened on the cactus, but green ones will ripen sitting out on your counter. These will never turn red, but will get softer and become a lighter green. If you pick your own fruit from the cactus, BE CAREFUL. The fruit has tiny thin prickles called glochids that are easy to overlook. If you get them in your skin, they're painful. Use leather gloves or tongs to pick the fruit and then use a hard bristled brush to scrape the glochids off before trying to peel them. 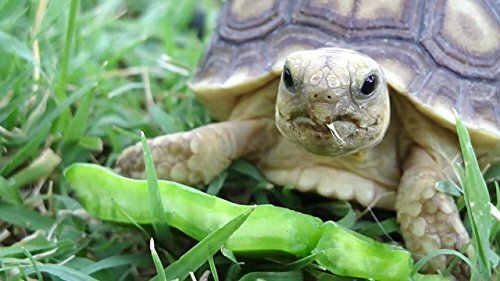 NOTE: If you harvest prickly pear fruit in the wild, leave enough for birds and other small animals to eat. 1 Slice both ends of the fruit off and throw them away. 2 Cut a thin vertical slice down the length of the fruit. 3 Slip your finger underneath the slice and hold onto the skin. 4 The skin will easily peel off as you pull on it. You won't eat the skin so throw it away, too. The flesh will be full of little hard seeds, which are edible if you care to eat them. You may prefer to extract the juice. If your fruit are large, you can probably get a cup of juice from 6 prickly pears. To make juice, place the peeled fruit into a blender or food processor and pulse until liquefied. Pour the pulp into a fine mesh sieve and push it around until the juice falls into out into your pitcher. You can add juice to lemonade, cocktails, tea, carbonated water, and soda. You can also pour fruit into a fruit salad, over ice cream, into yogurt, etc. You might experiment and use the pulp in desserts, yogurt, or other dishes. Twist off or cut a medium-sized pad off of a healthy cactus; protect your hands from the thorns! Let the pad sit outside in the shade for about four days or up to a couple of weeks. If you plant the pad while the cut is oozing, it may rot or allow a fungal infection to enter. When you plant your cactus pad, place it at an angle into the dirt and bury it so that a third or half of it is underground. Water the pad well right after you plant it, and then once about every 3 or 4 days for about a week. After that, only water every couple of weeks. After the plant is growing well, don't water at all unless it has no access to rainwater. After all, a cactus is a desert plant. Eventually, as your cactus pad grows, it'll create new pads and you can keep cutting them off to make new plants. burntchestnut, Prickly pear cacti brighten the landscape as well as dinner plates! Yes, the flowers are edible -- they're good fresh (raw) or sautéed. WriterArtist - Do you eat the blooms raw or cook them? This was a wonderful article! I saw a TV show on the prickly pear cactus hosted by a girl who showcases edible wild plants. Her shows are interesting, and so was your article. I love the beautiful cactus flowers, never knew they were edible. A well written beautiful page on prickly pears. It is so amazing that you can eat it, I love the yellow blooms.